And so I have; taken them out and in to use. Although it still is pretty warm* and wet over here; I wouldn't have had to quite yet. *)=That of course depends on what you compare it with. Warm as in plus degrees yes, but the weather is still totally, like we say over here, from the arse. 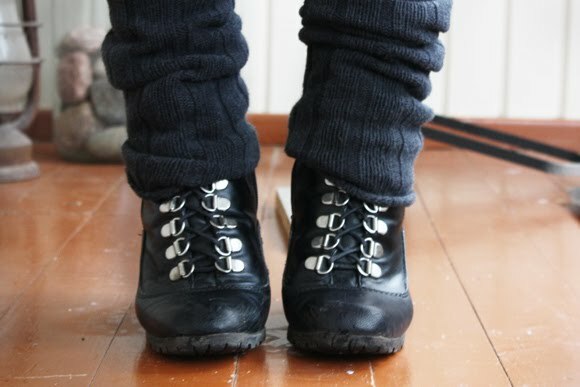 I got these boots last year as I needed shoes for winter and thought they were pretty ok, although a bit 'trendy' for my taste due to the extra zipper on the side without any use. However, they turned out to be super comfy, kept warmth surprisingly well considering they are made out man made materials only, they fitted an extra pair of socks and still made my feet look super tiny and they did not let any water in when it was soggy and wet. Nor did I really think of that zipper either. So, it was a smart buy, I wore them a lot and I almost worn them out. That's why I was smart at the end of last winter and bought myself another pair! So far I'm still wearing the old ones, and saving the extra pair for later. 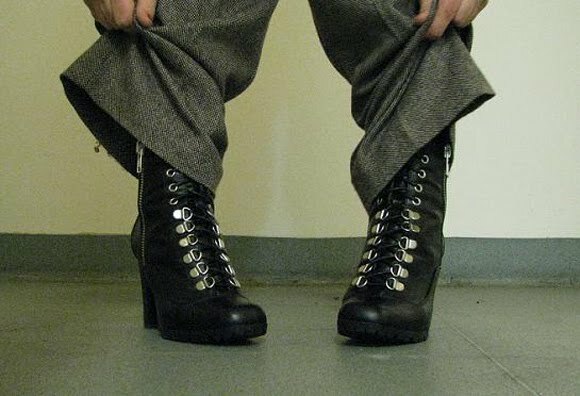 Anyway, I have received lots of questions from people elsewhere about the boots and where to find such; mine are from Din Sko, a shoe chain here in Scandinavia with rather cheap shoes, often considered to be of rather low quality. (Funny thing is, the shoes I've worn most for daily use and have lasted a long time have been form Din Sko...). The company makes new collections every season so I'm afraid they do not carry these shoes any longer (although they seem to have an uglier version available). But, perhaps this will interest some of you; I spotted a smiliar kind of skiing-inspired boot on ModCloth; the Bowery Boot! Oh, a little PS. still concerning shopping : Shabby Apple is offering the readers of The Freelancer's Fashion Blog a 10% discount for thirty days; Monday November 15th to December 15th! Shabby Apple has lots of lovely dresses, jewelry and other accessories. The code is freelance5810 and the shop can be found at shabbyapple.com. I didn´t know the expression " from the arse"... it is very useful to know that there is a literal expression for our "como el culo"
i love your boots.. For winter i choose DR Martens regina model... ( http://www.cloggs.co.uk/content/ebiz/cloggs/invt/7806/dr_martens_regina_m.jpg ) it's are very comfy and warm... So i confess that I'm a huge martens fan since my goth years ! I love the heeled Doc Martens range too. Can't ever imagine slipping in these. A good choice. Finnish "from arse" weather. Then again, the pouring rain + wind has been from arse lately even here. I think those boots of your are simply stunning. Despite of the "trendy" zip they just scream vintage. Actually, they have them this season too. I bought mine on sale last year for less than 20€ and now they cost around 50€ I think. They also have another pair without the zipper on the side and without the buckles, I personally like them though. I should buy some new ones too, mine are worn out from dancing too much with them. And they are extremely comfy and look great on! Hmm, can't seem to find them on the internet. But I saw them as new stock, not on sale when I left Oslo in middle of October. So they should be in the shops, hope so anyway. Wish I was as foreseeing as you regarding good and comfy winter shoes. EEEEK! I love Shabby Apple. Why you do this to me, girl?! haha there goes my no shopping rule! Päivi : joo huomasin. Kiva kauppa mutta ihan outoa miten niillä voi olla nii kovia postikuluja. Ehdottivat give-awaytä mutta se ois koskenu vain jenkkiläisiä lukijoita nii kieltäydyin. I would die for these boots! I want a pair so bad. They're absolutely adorable. indeed the time is there to get out the boots - I own practicly only pump - just one pair of boots so need to start my hunt for an extra pair! 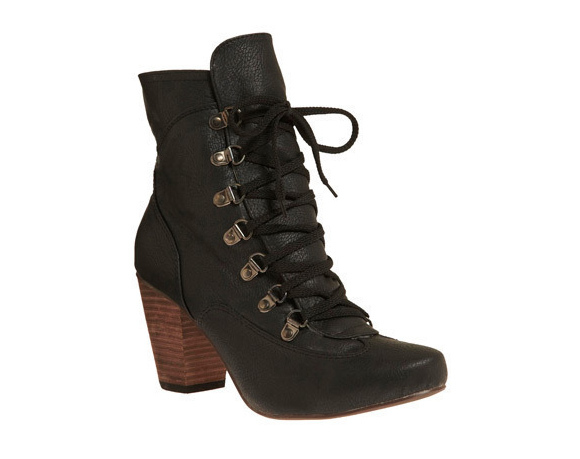 Kinda similar to yours, and the modcloth boots you posted :-) They are sooooo comfy!